I have reduce the image and image file. The original image was 5573x3969 and 3.87 mb, i have save the file at high resolution . . . Very cool battle scene. I especially like the birds flying away from the angel's tail. Great work. Nice battle scene between the Angel and the strange looking bird. Having the mountain (Mt. Fuji ?) behind thefight scene makes the scan more tasteful to look at. What I like about this scan is the hills. If youlook at the hills, they fade into the background..
Having the conical mtn. Makes it more interesting. Love seeing the snow on the top of the mtn. The scan looks very clean. Even on a BlackBerry hand held unit, the image is clean. 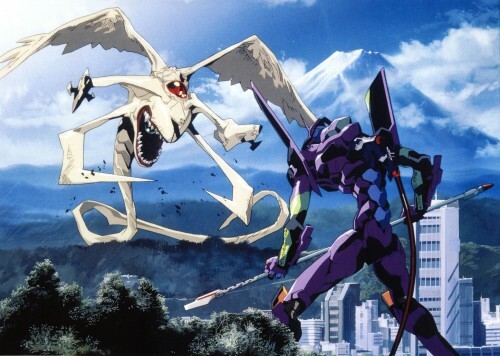 I know this much, if I was an "alien", I would think twice before taking on a "EVA" unit. Thanxs for the share ! Thumbs up ! SIN DUDA ALGUNA UNO DE LOS MEJORES ANIME QUE EXISTEN! It Seems that EVA-01 fights against ine of EVA SERIES, as a final battle as Lilin. Wasn't this from the sega saturn games?